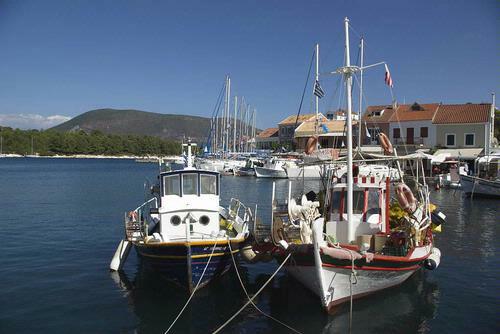 Fishing boats in the picturesque harbour at Fiskardo. Kefalonia is the largest and most mountainous of the Ionian islands - a jewel in the deep blue Ionian Sea. The island is dominated by the bulk of Mount Ainos which reaches a height of 1627 meters above sea level and its ranges form the backbone of the island. The coastline has a number of harbours, safe sandy beaches and dramatic cliffs. Visitors to Kefalonia are able to enjoy a wealth of superb and often secluded beaches; busy beach resorts; quiet, laid back villages; a thriving capital in Argostoli; fantastic scenery and a rich sense of history everywhere. Spring is when the island bursts into life with a display of wild flowers and lush foliage. This is the best time to visit for those who enjoy walking holidays. The countryside is at its best and the temperatures are comfortable. In summer, the island is busy with holiday makers who throng the main resorts, towns and villages. Advance booking of accommodation is essential in July and August. Autumn brings a quieter time when the island slowly settles back to its normal pace of life. 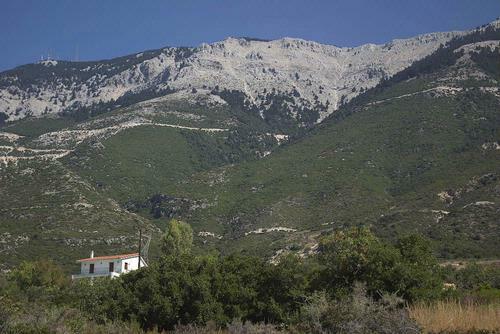 The spectacular Mount Ainos dominates Kefalonia. Temperatures are more comfortable than in high season and the sea water is at its warmest. It is a good time to visit. Everything about the island invites the visitor to enjoy the laid back carefree atmosphere, family and friends, good food and wine,the natural beauty of the island, the excellent beaches and the crystal clear sea.